I'm obsessed with candles. The soft lighting, the scents, the warmth - it's intoxicating and addicting to say the least. Ever since I moved out of school-sponsored housing and the "no candles" rule was no more, I've since collected as many tolerable scented candles (headache-inducing smells not included) and fancy-dancy candle holders to keep 'em looking pretty and not getting hot wax or fire everywhere. Moving into my own place away from roommates only added to my obsession. More candles came out especially since my apartment's internal heater makes my apartment smell like a gas station in the winter months. Gotta mask the gas somehow! Scent can change the mood in a snap, so shouldn't a candle holder be easy on the eyes, too? This particular candle holder was found at one of my usual thrift shops. This clear glass bulbous thing needed an obvious upgrade, and I can tell just how the previous owner did it. 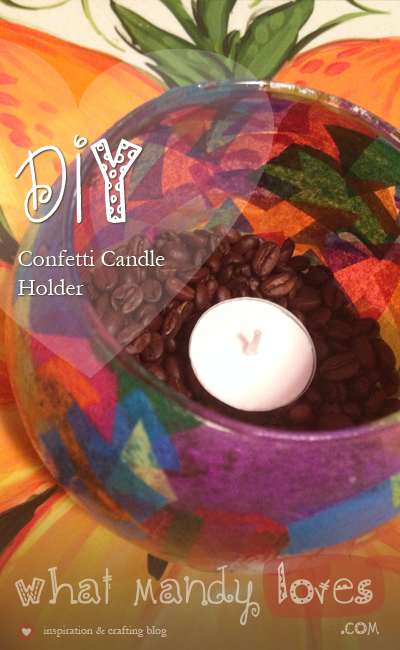 BONUS MINI-TIP: Tea lights + coffee beans = HEAVENLY! 1. Start off by cutting strips of tissue paper into confetti shapes of your choice. The more colors the better! 2. Spread a thin layer of Mod Podge all over the outside of the candle holder with a foam brush. 3. Layer on as many confetti pieces as you want all over the place. You may need to lather on some Mod Podge to some tricky pieces as you add layers. 4. Add a thin layer of Mod Podge all over when finished (optional but recommended). 5. Let it dry for 12-24 hours before lighting a candle in your new and improved holder. 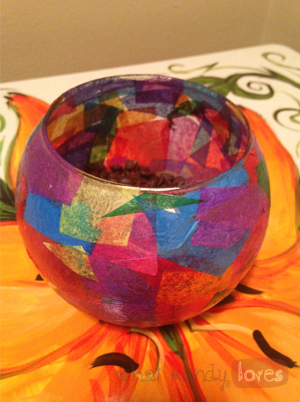 How have you decorated an unsightly candle holder? Let me know in the comments!